In today’s episode we’re back with another Listener Q&A session! We received some REALLY great questions from our listeners over the past few weeks & narrowed down the ones (we think) would be the most beneficial Q&A’s for all our listeners. 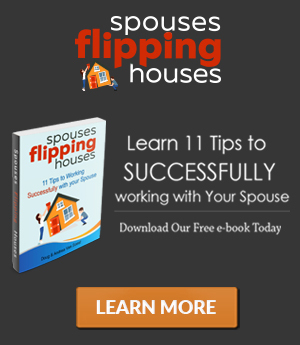 Tune in now for the 2nd Spouses Flipping Houses Q&A session! Doug: Spouses Flipping Houses, Episode 30. Andrea: This week we are going to be answering your questions that you have been emailing to us, so we have compiled some of our favorites and some that we think would be most beneficial for everyone to hear the answer to. And so we will be going over those. Doug: Yeah we’ll be diving into that. Thank you for sending great questions by the way. We’ve been talking about this episode coming up for probably five or six weeks now and getting a lot of great questions. Thanks for being patient with us on replying to you in the emails. Sometimes they’ve gone to random inboxes that we didn’t know we had. Andrea: I think we found them all though. I hope. If for some reason you sent us an email and we did not respond, then it’s probably because you might have sent it through our website on the ‘Contact Us’ form, which we realized there was a glitch with that. 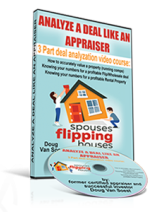 So if you have questions, send them to andrea@spousesflippinghouses.com. We’ll definitely get your question answered and maybe it will be featured on the next Q & A episode that we do. Doug: Yeah because we will do more. So Andrea, do you have an update for us on the cat pee house? Andrea: I do. So funny enough, we mentioned this on last week’s episode, and I got tons of people emailing me to let me know what I could use to solve this problem. Doug: Apparently odor hiding and odor problems are common out there. Andrea: So funny enough, I think four or five people recommended the same product, which is something called Bin. Doug: Like B-I-N from Home Depot. Andrea: And it’s something that basically seals the smell in, so it traps it into wherever it is in the wall or flooring, baseboards, whatever it might be. So that’s kind of interesting. We didn’t check that one out, but the fact that so many people recommended it must mean that it’s good. A few other people recommended some other different things. What we actually ended up using worked great, and it was an industrial orange oil product. It’s a little bit more natural. Seriously, walking up to the house it smelled amazing, and I hadn’t even opened the front door yet, just the smell of citrus. Doug: Did it smell like a citrus grove? Andrea: So if you’ve ever ridden that ride at Disneyland, Soaring Over California. Doug: Oh, yeah! Soaring Over California. Andrea: So as you’re going over there’s the winery, and the golf course, and you see a golf ball fly at you. And then at one point you’re flying over these orange orchards in California because we’re known for our orange orchards here I guess, and it smells amazing. So you have to go to Disneyland and ride that ride so you’ll know what I’m talking about. That’s what this house smells like. Doug: Good, good. So it’s nice, fresh, orange juice smell. Andrea: Super fresh. Smelled great. So anyways, it’s called Angry Orange. I bought it on Amazon, pretty affordable. Doug: That’s where all of the best things are found, Amazon.com. Andrea: Yes, I love Amazon. So if you’re having this problem and you want something that’s going to neutralize the odor and smell fantastic. I mean I can’t even tell you. This house went from smelling so gross to smelling really, really good. Doug: Well, there you go. And it was pretty cheap too. It wasn’t that expensive. Andrea: Yeah it was $20 a bottle, and that mixes with a gallon of water. We actually had to use ten bottles, ten gallons for this house. Doug: And this is not a large house. This is like a thousand square foot house; it’s a small house. Andrea: But we wanted to make sure that the problem was solved, and the problem was solved. Doug: Okay good, oranges, orange juice. Andrea: So another interesting thing happened this week Doug. We thought it was interesting, and then it turned out to be really interesting. Doug: Yeah, there’s always something different in this business. So we thought we had a homerun deal a couple days ago. We got a contract back and first of all, we sent the contract via email, and it came back in like five minutes signed. Andrea: Which is a little bit. Doug: It’s red flag number one. Andrea: Well not necessarily a red flag, but it just doesn’t usually happen that way. Doug: Well and the fact that our offer was about $75,000 less than what he said he would take. I think he wanted $650,000. We offered $575,000 and boom! Contract came back signed, and we thought man, this is fantastic. Again, one eyebrow raised here. But it was tenant-occupied, so there was some kind of different weird situation with the tenant that the seller didn’t really have all of their information. He said like a partner had rented the property, so we needed to inspect this house. So we got a hold of the tenant and set up an appointment for a few days later. So we said, “Great. Put us on your list. We want to buy it when that time comes.” So who knows, maybe it will come back around. Andrea: I hope it does because I was most excited about it because I think it would be a fun rehab project. It’s in a very cool area. I think it would be a super fun project. Andrea: You were super excited about it because the numbers were really, really good, so we’ll see if it comes back around. But that was kind of a first. We have had title discrepancies where maybe someone has inherited a home and their sibling is squabbling over it, but we have not come across that yet where a person has completely fraudulently taken title to a property that absolutely did not belong to them. Doug: Yeah and this is why you go through an escrow or title company, whatever state you’re in and get title insurance on everything. Do not buy property, in our opinion, without title insurance because this kind of stuff happens. Somebody may have done something in the past that could come back to bite you if you buy this property uninsured, so definitely do that. Okay, but enough of that. Let’s get into the good stuff here, the questions and answers. Andrea: We’ve got a total of four questions that we’re going to be going over, and the first one comes to us from Anna. I’m not going to read last names. I’ll just keep people’s privacy intact. Andrea: We’ll just go with the first names. Okay so question number one from Anna. Doug: Let’s call her Jill. Andrea: Well no, she needs to know that it’s from Anna. Okay, Anna. Anna said: I just listened to your number 18 podcast again and in it, you say that you do not provide a refrigerator. I went back three times because I wasn’t sure if I had misheard, but there it was again. Can you explain? It seems like something that would be essential to a rental. A dishwasher the tenant could do without, but how do you say that a refrigerator is an amenity? So I thought that this was a really great question. I think that a lot of landlords or prospective landlords might be curious as to why we don’t provide a refrigerator, if that’s something they’re not familiar with. And there’s no right or wrong answer here. This is just how we choose to do it. Doug: Yeah I think it’s a little bit area-specific and also property-specific, so let me explain that. Here, it seems like, at least in Southern California where we are, that not too many people who are renting houses actually provide refrigerators. At least that’s our observation, that’s our experience. When we first rented a home in this area before we bought a home, I don’t believe it had a refrigerator. It’s just something that typically people own their own, around here, and they move that from place to place. It’s kind of like your domain for your food, and you want to keep it clean, and it’s kind of their own personal belonging. Andrea: And technically speaking, from an appraiser’s perspective, a refrigerator is considered personal property. It’s not considered a fixture to the house like the dishwasher or the stove might be. Doug: Right, and that’s a good point. It is personal property. When you sell a house, a refrigerator is not considered part of the house because it’s not attached to the home. Dishwashers, stoves, because they’re kind of plugged into a gas line and things like that, for whatever reason they’re considered part of the home, just like ceiling fans and things like that. But washer/dryer and refrigerators aren’t. They are typically an amenity. So with single-family homes, it’s just common in our area not to put them in. So we choose not to do that. The tenant can provide their own. Andrea: I think that it’s more expected from a prospective tenant if they’re going to be renting an apartment or a condo. Those are typically very turnkey. It’s expected that a refrigerator will be provided but in a home, believe it or not we’ve never lost a tenant due to the fact that we didn’t provide a refrigerator. Doug: Right. Now you could provide refrigerators in a home, and maybe that’s a bonus to some people and you might get some tenants that way. We’ve never seen it as a negative that we know of. Nobody has not rented one of our properties because we didn’t have a refrigerator there. And this is also how we kind of look at it: if you have one rental, well that’s one thing. You have one refrigerator to worry about, but when you start getting multiple rental properties and adding up, pretty soon you have 30/40/50 rental properties. If you have 50 refrigerators that you now have to worry about as well, those things break. They need cleaning. Things fall apart. That’s just an extra item for you to worry about and an extra expense for you if you’re renting these properties. So we choose not to do it. Andrea: It just cuts into the cash flow. If you’re replacing ten refrigerators a year, that eats up a lot of your cash flow. Andrea: Right, exactly. So basically to recap, if you’re going to be somebody that just has one or two rental properties, and you want to go ahead and provide a refrigerator just as one extra little bonus thing to help you get a better tenant, and you think that’s going to help you, then awesome. Go ahead and do that. There’s no right or wrong answer here. But if you start creating a business of this and you have lots and lots of rentals, you might want to consider not providing a refrigerator. Doug: Yeah, I think just like selling a home, check your comps. If it’s expected in the area and everybody else is providing a refrigerator, maybe you need to do it. It just depends. Andrea: Yeah, okay question number two. This question is from Sam and Kylie, and the question is: when doing a wholesale, the fourth way that you mentioned with an agreement (so from that last episode, a couple of episodes ago on wholesaling). Doug: The fourth way was an assignment, right? Andrea: Yeah, assignment of the contract. Do you use a real estate agent and does the real estate agent write the agreement into the offer? Doug: Okay, let me tackle the first question there. When doing an assignment as a wholesale, do you use a real estate agent? The answer to that is no, and that is because in our business, we are primarily buying homes directly from the owner. So we are advertising to them; we’re sending letters, mailers, Internet ads, things like that directly to an owner of a property, and then we’re coming to an agreement and buying the home. So there are no agents involved. They say, “Yes.” So no agents need to be involved and that way they’re not paying commissions. You two come to an agreement with your contract; you take that contract to escrow, and escrow can handle it from there. And we’ll say, “No. You don’t need a license to buy a property.” The agents are there to assist you and help you if you need it, but you do not have to have an agent. So yeah, this is a for-sale-by-owner. Andrea: And then Sam and Kylie asked as a follow-up question: Do you need to provide a prequal letter when you’re meeting with a prospective seller? Doug: Yeah and again, if you are in the normal transaction world where you’re making offers with agents on the Multiple Listing Service, probably yes. You need to provide some kind of proof of ability to buy the home, but we’re not talking about that type of transaction. We’re talking about buying a home directly from the owner and in order to even get into that place where you are dealing with an owner, you have probably advertised to them, marketed to them somehow, or they came to you through some kind of referral— where you are the expert, the investor. And you need to go into this negotiation with confidence. And therefore, because we approach it that way when we’re talking to the sellers, there’s no question in their mind we have the ability to buy this property, because we do. I think one time in all of these years have we been asked for some kind of proof of funds or prequal letter of some kind, so it really is a non-issue. You absolutely don’t need a proof of funds; don’t worry about it. Just go into the negotiation with confidence, and it’s not going to be something that they’re going to ask you for. Andrea: Yeah I think that if these people have seen your bandit sign or they’ve gotten your postcard that says, “We Buy Houses! Fast Cash, Close in Seven Days,” whatever it may be, they are already viewing you as an expert. They just assume you have the funds to close, so I wouldn’t even stress about that. Andrea: Question number three comes from Ben and Rocio. I hope I am saying your name right; I’m sorry if I’m not. Their question is this: my wife and I have been investing in real estate for eight years now, however we only have two rental properties. How can we expedite accumulating more properties? The buy-and-hold strategy works well with our lifestyle, but we want to grow our business much quicker than our current pace. And then their second question was: one of our rental properties has approximately $200,000 in equity. Should we use that equity to invest in a flip or should we buy and hold? And they were always curious with the two of them working full-time, if it’s realistic for them to flip a house. Okay, so this is a very subjective question. You can get probably several different answers if you asked several different investors, so I’m going to just tell you what we would do here with your main question being how can we expedite the process of getting more rental properties. So if it was Doug and I, this is what we would probably do. You have $200,000 in equity sitting in one of your rental properties, so the way to access that equity is one of two things. You can refinance it and pull out that $200,000 in cash to use or you can sell that property to use that $200,000 in cash. We would probably sell that property because let’s say that home currently has a loan for $200,000 on it, and it’s collecting $2,000 in rent. If you want to pull that equity out through a refinance, now that home has a $400,000 loan on it and is still only getting $2,000 a month in rent. Doug: That’s a good thing. Andrea: You could split that up into chunks of $20,000, $25,000 down payments and quickly pick up an additional eight to ten rental properties. Doug: Yeah, and you wouldn’t even have to buy them significantly below market. The financing is such a great deal right now on the low-interest long-term fixed rates that you can get. If it makes sense from a cash flow perspective and you’re not being foolish, go buy several of those with the loans you have the ability to get right now. Because we’re jealous of that. We are self-employed, and we don’t fit in the box for most typical lenders wanting a W-2 and all of this history of employment and different things. So it’s very challenging to get loans. Andrea: Just the sheer fact that we’re self-employed, we automatically take at least a one percent higher interest rate on all loans that we get. So you guys are in a great situation as far as that goes. I kind of focused my answer on how you can hold more properties because you did say that fits best with your lifestyle, and I think that’s a great option. I love buy-and-hold. However, if you wanted to try and flip a property instead, I absolutely think you could do it while working full-time. Obviously, just like anything, it’s going to take a lot of hard work and effort in your off hours, because the hardest part is finding that deal. So if you’re working nine to five, it’s going to be a bit tricky to find those deals because that’s going to have to be where you spend most of your effort in the beginning. Once you have a deal, totally you can flip a house all day long while you have a job, no sweat. On the weekends, evenings, you’re lining things up with contractors and what not, easy. But it will just be a matter of finding that deal, and it can be done. Doug: So I would, in your case, working full-time, I would try to leverage everybody that you can. Try to find wholesalers, reach out to wholesalers who may have deals. Sure, you’re going to go through a lot of them that may not be deals, but there are some diamonds in the rough there. Agents that are familiar with investors, we had an episode a while back on working with agents, get little birddogs (we call them) or little minions who are looking for you for deals since you’re working full-time. Leverage some of that, have people try to bring you deals. That’s what I would do. Andrea: So if you choose to spend your equity to flip a house, it’s definitely possible. Question number four is from two of our favorite Instagram followers, Brent and Sarah. And they are with Green Key Homes. I hope they don’t mind me saying that. Andrea: @GreenKeyHomes on Instagram. They are doing some cool stuff too, so follow them. This is their question: when you buy a house off-market directly from the homeowner, how do you find a good title company that is familiar with the investor process? We have only bought houses with real estate agents, and they made the process really easy. Everything just comes via a document you sign. Is there much paperwork for the seller to sign when it is a direct sail? Doug: Okay, so I’m going to start with that first question there which is how do you find a good title company familiar with the title process? And this is a great question because I can remember ourselves in this exact situation maybe six or seven years ago when we needed a good title company. So there are a couple of ways. First of all, I would say try to get referrals. There’s several places you can go to find that. Real estate investing clubs in your area, real estate investors associations if you’ve ever been to those, most areas have them and they’re usually meeting once a month, $15/20/30 to go and there’s usually a speaker. A great place to go anyway if you’re going to be getting into real estate investing, but there are investors there. And ask for referrals, “Hey, what title company do you use? What escrow company? What closing attorney?” depending on the state that you’re in. Get a referral. If that’s not available to you or you just can’t get referrals, you can do what we did. And I would just open the phonebook, or that’s kind of dating me. Andrea: That’s a little dated. I’m looking for someone who yes, is familiar with investors and how they work because we do creative deals and different types of deals. Yes, we’re familiar with the for-sale-by-owner process and handling all of that paperwork, and I’m looking for at least 15 years experience. I want somebody that has been around the block a couple times in real estate, because old transaction types, old strategies seem to come around again. And we want someone who has seen a lot of different types of transactions, and knows what to do, and has handled them. And just has experience dealing with these things. Andrea: Not only that, but a seasoned vet escrow agent has seen everything. They’re just not shocked, and weird stuff comes out. You wouldn’t believe it. So they’ve seen everything. They’re not shocked by it, and they usually have a solution that you might not have thought of. It can be super valuable. Doug: Yeah this is a very valuable member of your team here. One question I don’t ask really is how much they charge. I’m not really concerned with that. It’s getting the good service and experience behind that, especially on the title side, that is super valuable, and I would pay top dollar for it because if you find a good title or escrow company, they’re well worth it. So that’s what I would do there. Andrea: And the second part of his question is: is there as much paperwork for the seller to sign when it’s a direct sale? Doug: Okay, simple answer is no. We have a one-page purchase contract. That’s what we use, so if you go through an agent and buy a home with a realtor, you probably have 30 to 40 pages of contracts, and disclosures, and all of these kinds of things. That’s the difference. You will have escrow paperwork that’s on every transaction. So escrow will generate their own, what’s called escrow documents or if you’re a title company/closing agent, whatever it is, they’ll typically have their standard set of documents that are going to be filled out on every transaction. But they’re not overwhelming. They’re reasonable. So there’s far less paperwork in dealing directly with the owner. Andrea: You may want to do a little research for your own state just to make sure that there is not something specific you need to provide that we don’t know about. But in our state, this is what works. Andrea: So that is it for this episode of question and answers. I hope it was helpful to more people than just the original question-askers. But if you have questions that you would like answered, please feel free to email them to me for our next question and answer episode, which will probably be next month. Doug: Yep, and we want to again ask you to go give us a rating and review in iTunes. If you would, please. Andrea: I know we keep asking for ratings and reviews, but the way that iTunes works is the more ratings and reviews you have, the higher that they rank you. It’s just kind of how they work, and so the more ratings and reviews we have, the higher up that we will be in our category and the more people that are able to find our podcast. So if you’d be willing to do that, we would so appreciate it. Doug: And if you have already, thank you so much. We read them; we love them. It really helps us out. We do appreciate that. We mentioned this on last week’s episode, and we again wanted to mention that we are speaking in October in San Diego at the Flip Hacking Live event, so you can get a lot of information about that event and sign up if you want. And you can go to our website, SpousesFlippingHouses.com/FlipHack, for more information on that. Doug: And that’s a wrap for today. Andrea: That’s it. Have a great week!